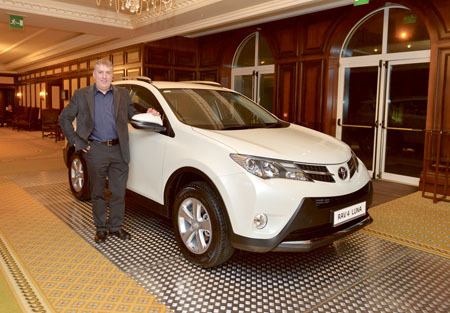 Pictured at the recent launch of the new Toyota RAV at Ritz Carlton in Powerscourt, Co Wicklow last Friday was Paul Coleman, managing director of Grange Motors in Mullingar. Toyota Ireland has announced the pricing for its hotly anticipated all-new RAV4 SUV. Starting at only €27,995, the new RAV4 represents a significant step forward with all-new distinctive, sophisticated styling, refined, premium-quality interior design, a new Integrated Dynamic Drive System, and an engaging drive with fuel efficient powertrains. The RAV4 will be unveiled in Toyota dealerships across the country at 7pm on March 14. The RAV4 marries the best of in-car technology such as reverse parking camera and the Toyota Touch multimedia system, with a host of safety features such as VSC, hill start assist control, and seven airbags. The new RAV4 has increased roominess, comfort, and luggage capacity to meet the needs of active families and the new powertrain line-up offers improved performance and reduced fuel consumption and emissions meaning road tax from only €270 per annum. In addition, with Toyota Flex, customers can own an all-new RAV4 from only €299 a month. Robinstown, Mullingar, Co Westmeath or phone (044 ) 9340694.